Disclaimer: The reviewer is a crazy Salman fan. Though, all attempts have been made to ensure that the review is unbiased, you might still want to take it with a pinch of salt. Done with the disclaimer! 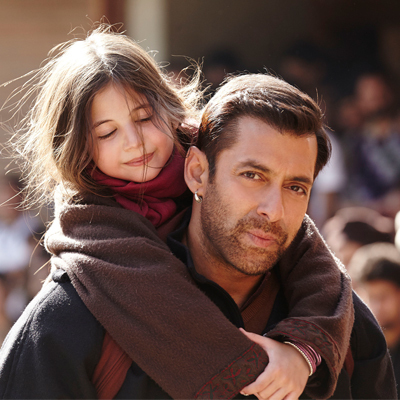 Now comes the review of the much awaited movie of the year – Bajrangi Bhaijan (wistle!). It’s a movie that will make you laugh, make you cry, make you whistle and make you clap too…what else do you need? Good music? Yes! the movie has that too. A beautiful romantic song, Tu Chahiye by Atif Aslam (though, I believe that it could have been placed better in the movie…after a few more romantic scenes may be); a devotional gem, Bhar Do Jholi by Adnan Sami and a quirky one Chicken-Kuk-Doo-Koo by Mohit Chauhan. The viewers who expect an item song in every Salman movie will be disappointed though. Story? It’s not something out of the box, takes time to pick up and it predictable indeed; but it has been presented well nevertheless. The innocence and warmth of the characters in the movie is very soothing. The touch of humor in emotions or vice versa makes the script very charming. But beyond all this what touched my heart is the way messages about compassion, humanity and against baseless religious prejudices have been delivered subtly all through the movie. Acting? I would not say that this is Salman’s best performance ever; because nothing beats Tere Naam. But the acting is heartwarming for sure. Those scenes where Salman is teary-eyed are my favorite from the movie. Kareena and Nawazuddin’s acting skills could have been used better…but then this was a Salman movie after all. Needless to say that the little girl Harshali’s acting was adorable. Tab Lage Mard Warna Lage Bekaar! " Minus the irritating dance moves by Salman in the Selfie Song, the movie is a good one time watch. I would also add the “child-friendly” tag to the movie – no vulgarity, minimal violence and a few good lessons in compassion for the kids.